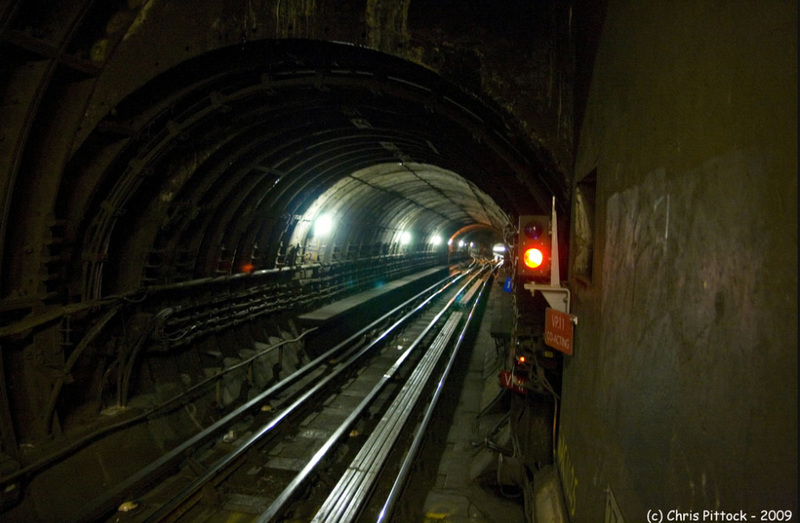 Perhaps because they represent a mysterious unseen underworld, disused Underground stations seem to fascinate a lot of people – including those who aren’t generally interested in trains. 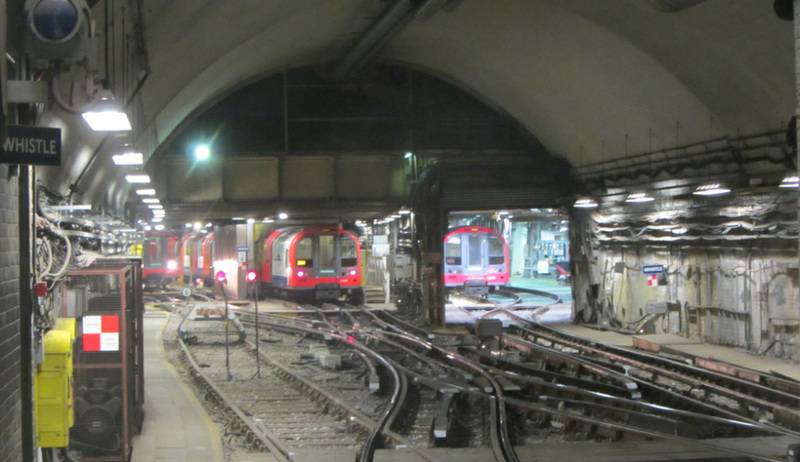 You could be forgiven for thinking that Underground sidings would carry the same cachet, but they seem to be a subject that is often overlooked. The majority of London’s underground sidings today have a curious property – almost none of them seem to be used for the purpose for which they were originally intended. 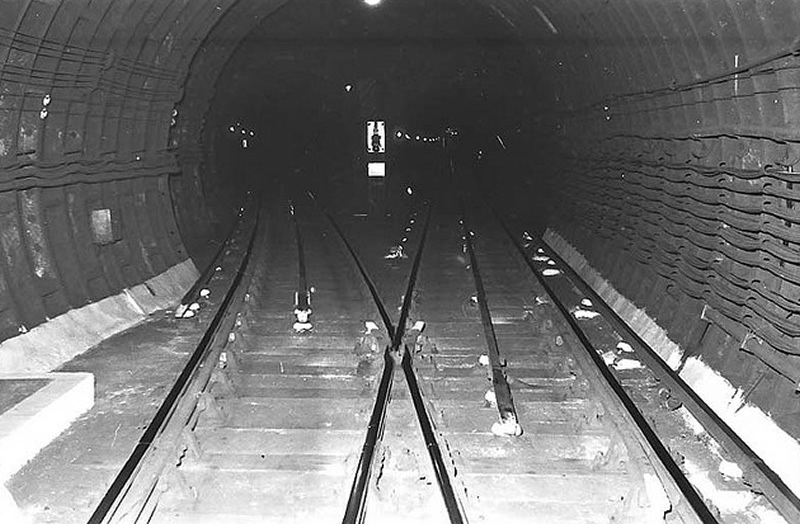 We have seen the exceptional case of Smithfield sidings primarily used for freight, but most subterranean sidings were primarily constructed to enable trains to terminate well short of the end of an underground line in order to reduce the number of lightly-loaded trains running all the way to the terminus station. 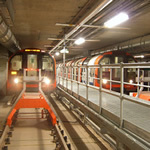 A siding was a relatively cheap option compared with the alternative of a very expensive extra platform – especially on the deep-level tubes. 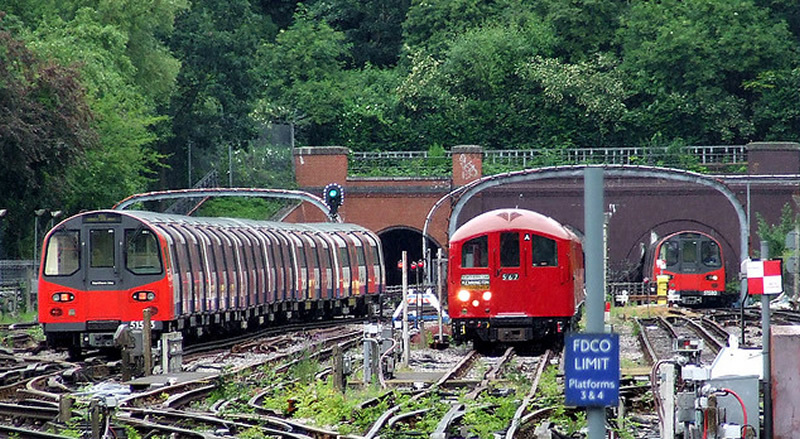 Deep-level sidings were regularly used on London Underground until the latter part of the 20th century. If you travelled on the underground in the 1960’s you would find destinations such as Liverpool Street, Marble Arch, Archway or Tooting Broadway quite commonplace. Even in the early 1970’s the newly-finished Victoria line regularly had timetabled trains terminating at both Victoria and King’s Cross. Today, with a more intensive service, the operational philosophy has changed. There are often enough passengers to justify a service from one end of the line to the other which has the benefit of offering a “turn-up and go” service. More critically, with today’s frequent service it is often just not possible to terminate a train in the central area or inner suburbs and check that there are no passengers still on board without delaying the train behind. This is even more true now that it is mandatory to check that no passengers remain on the train. Indeed when the Victoria line was extended to Brixton it was quickly realised that by the time the train was emptied at Victoria, had gone into the sidings, the driver walked down through the eight car train and he had returned northbound in his allocated slot he might just as well have gone to Brixton in revenue-earning service. If you ever wonder why quiet semi-rural places like Cockfosters have such a good service it is simply because there are very few places suitable to terminate trains previously without causing disruption. The consequence of all this is that expensive underground sidings could not be justified on the basis of their original purpose. Given that they are quite costly to maintain does that mean that they are practically redundant? Not a bit of it! The first justification for a siding today is as a “cripple siding”. Basically if a train cannot move at normal speed under its own power, the controller will be desperate to get it off the running lines as soon as possible so that the service can continue. In effect, this is the railway operational equivalent of “any port in a storm”. This might not be a frequent use of a siding but when used it can mean the difference between “good service” and “service suspended”. On its own this is almost sufficient justification for a siding such as Down Street on the Piccadilly line to be maintained, despite it being extremely inconvenient in many ways – not least the fact that the only permitted way to exit is to walk along the main tracks to Hyde Park Corner. Similarly another siding which is of limited use, but which is still retained, is that at the former British Museum station on the Central line. Use as a cripple siding is not just limited to passenger trains. If there is a problem with an engineering train at night, or simply the fact that it cannot return to base without impacting on the first trains in service, then the sensible thing is to get it off the “main line” using the nearest available stabling point and worry about it after the end of the day’s service. The second use of sidings is to be able to provide a decent service from the first train of the day right up to the last train of the day. Obviously this is more important if part of the line is distant from the main depot or depots. For this reason the underground terminus stations of Walthamstow Central, Brixton and Elephant and Castle have sidings beyond the platforms, as did Charing Cross (Jubilee line) when it was open and they are presumably still available for use now. In the case of Elephant & Castle the nearest depot is actually extremely close, but it is awkward to get from there to Elephant & Castle station as it involves a reversal on the running tracks. Sidings at such locations may seem unnecessary, as the trains could potentially stable in the platforms. This is certainly possible but the sidings also conveniently double as an overrun, allowing the trains to approach the platform at speed as there is no need for “train protection at terminal stations” (colloquially known as “Moorgate control”). Having a train in a siding also means that if it fails at the start of the day, it doesn’t block a platform. It also means that maintenance can be carried out on the track within the platform area itself at night. Generally once a week, however, (usually on a Friday or Saturday night) the train is stabled in the platform. This obviously allows regular inspections and maintenance carried out on the siding itself. The third main benefit of a siding is that it is somewhere to get rid of a train when the service falls to pieces. If a controller experiences a problem on the line (such as a ten minute delay because a door won’t close) then one of the biggest problem this creates is that it causes the trains to bunch. This potentially leaves a number of trains stuck in tunnels for long periods of time. The best and quickest way to get rid of this problem is to thin out the service until it is running smoothly again, and then to reintroduce the trains removed from service in a gradual and orderly manner. One problem in this situation is that it is almost always worst where the stations are closest – the central section. This is, of course, precisely the section where sidings and other places to temporarily store trains are scarcest. Here the Central line is very fortunate as it has 16 sidings located underneath the Westfield shopping centre at White City which used to be 15 open-air sidings before the over-development. The Victoria line is probably the line that suffers the most, with it possessing no non-intensively used section and being entirely underground. South of Seven Sisters it also only has intermediate sidings at Victoria (2) and King’s Cross (1). Also, as London Underground delight in telling us, the line currently has 37 trains but only 33 platforms, so evacuating people in the event of a train failure becomes quite problematic – and that is before they introduce even more trains at the final stage of the upgrade. Another use of sidings is to terminate a train short of destination in order to regulate the service (fill a gap going the other way) but nowadays this can easily become problematic. The driver has a limit to the hours he is allowed to drive and he may be sent away from his signing-on point. Furthermore, the train must return to its home depot at least every 48 hours for a mandatory check and messing around with train diagrams may cause this to be missed. It is a situation not helped by the fact that a controller will not instantly know where the train and the driver are based, which nowadays need not be the same place. Slightly different (but certainly related) is the train held in a siding specifically for the finish of a big event but with the current frequencies run this becomes less of either an option or a necessity. At some places other than termini there are actually two sidings. Liverpool Street (Central line) and Victoria (Victoria line) both have two. Victoria actually used to have four but two were used to extend the line to Brixton. More unusually, Down Street (between Green Park and Hyde Park Corner on the Piccadilly line) and Kennington have a double-length siding. In the case of Kennington there is even a second exit half way down, so that one train is not trapped behind another. Due to a fatal accident at Tooting Broadway, however, where it was suspected that the driver mistook his location for the longer siding at Kennington, it has since been the policy to only provide signalling for one-berth at these locations. This is no great loss. A second berth at Down Street isn’t really needed and Kennington also has a loop although this can only be accessed from the Charing Cross branch. One way around this for the future though would be to arrange for the trains to enter into the sidings unmanned. This would also overcome the problem of leaving the driver trapped with his train for long periods, as well as making it easier for trains to enter and exit sidings by a shunt manoeuvre so that sidings could be used “from the wrong direction”. Of course the problem of the trapped driver would have been less of an issue in true “tube” sidings if a pedestrian exit had been provided, but this is almost never the case. It is said, however, that the siding at Kennington has an exit to Oval station and this does seem plausible given how long it is and how close the end of it is to that station. The Northbound Trailing Junction at Kennington. The loop is to the right. By Owen D.Smithers. It is probably a sign of how useful sidings continue to be that there is only one case of a deep-level siding not still being in use. That is at Queensway, but it is located east of the station and must be approached from the west which limits it value. It is also close to the siding at Marble Arch and the far better facilities at White City which are only four stops further down the line. It may be the case that the siding simply was not long enough for the current length of trains which brings us to the issue of sidings being too short. One of the often forgotten problems of extending train length is that the sidings (and depots) may not be able to accommodate the longer trains. 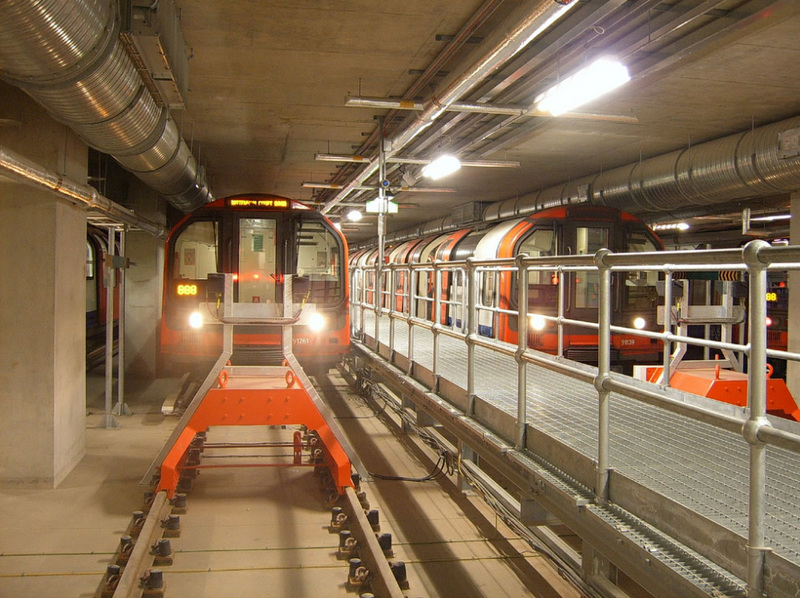 Although it may not be too difficult to extend sidings underground, it would normally be expensive and involve legal procedures before work could start. There is a case of a surface siding at Golders Green that needed extending from six to seven cars but the hillside was in the way. 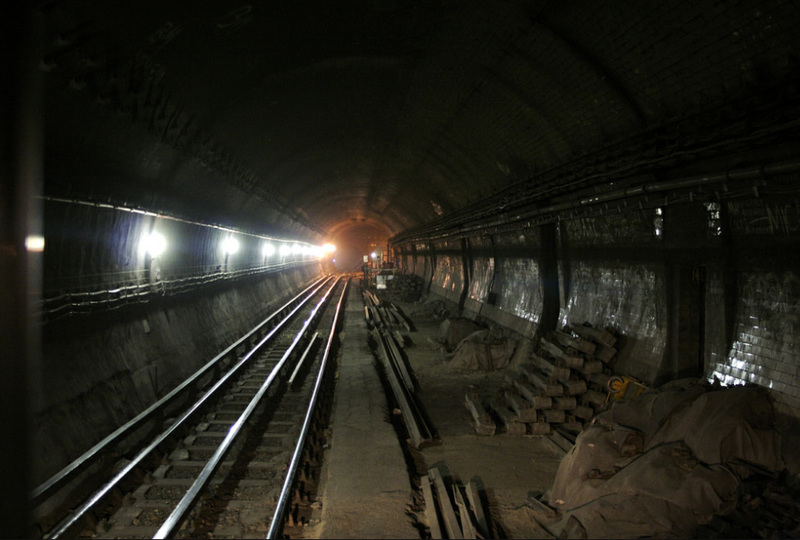 The siding was extended by creating a third tunnel mouth (the Northern line surfaces at Golders Green) that only extends into the hillside by one carriage length. Luckily, it appears that short sidings have so far not been a problem for the deep level tubes. The situation is, however, quite different for the sub-surface lines – especially with the introduction of the longer S7 stock. After all, there is no equivalent of simply introducing selective door operation if the siding is too short. With the main depots on the sub-surface lines being a long way out (Hammersmith, Neasden, Upminster) it is important to have stabling sidings located nearer the centre. The situation is made worse because the current ones (Farringdon, Parsons Green and “Triangle Sidings” near Gloucester Road) cannot be extended easily. In particular Triangle Sidings, more conveniently located than Parsons Green, is a very tight fit even for C6 stock and, due to it both being built over and also abutting the running lines, it is almost impossible to extend. So the hunt is on for alternative options and as mentioned in our article about the Widened lines it seems that the likely solution is to convert these to a long linear siding with the advantage of trains being able to depart in either direction. It is fortunate that these lines have been returned to London Underground, the owners, as a result of the Thameslink Programme. These would of course for the most part be located underground. It must not be forgotten that there are also subterranean sidings on the National Rail network. Smithfield carriage sidings are located to the west of the running lines between City Thameslink and Farringdon, with the buffer stops almost by Farringdon station. As such the name is slightly misleading and also easily confused with the former Smithfield goods sidings. Unfortunately the two sidings cannot be extended from the current eight carriages and so will be only useable by a proportion of the proposed Thameslink stock. The overhead wires have been extended southwards from Farringdon to City Thameslink and the eventual intention is that in the northbound direction the changeover from AC to DC would takes place at City Thameslink. In the event of a pantograph or similar failure the train could simply continue to Smithfield sidings where it would stable until a convenient opportunity was available to send it to the depot at Three Bridges for the fault to be rectified. It must not be forgotten that the Waterloo & City line manages in this as in many other cases to be completely different and uniquely has a complete underground depot where the trains are serviced. One suspects that space is extremely cramped. Whilst it is unlikely that the train length will ever be extended due to the difficulty of extending the platforms at Bank it is not known if an extra train could be accommodated if required. Currently there are five trains based there and all five are in service in the morning peak. At present there are no extra trains available, but when the stock is replaced it will presumably be desirable to have a spare – provided there is somewhere to put it. So *that’s* why there are three tunnel portals at Golders Green…..I’ve always wondered about that! Which one is the siding (I would have thought the middle one but then the newer one looks to be the lefthand-most one in the photo)? @Anonymous Carto is the usual place to quickly check these things out. Indeed, it seems the newer-looking tunnel on the east side is the siding extension. Reversing a very full train to re-balance the southbound service at Finchley on the Northern in the 1950s, produced a large group of very irate Barnet bound passengers. This happened much too often and finally there were passenger mutinies. I was present on two occasions, when passengers simply refused to get off. In both those cases after maybe ten minutes the controller gave in and we proceeded. One very very occasionally saw BT police around thereafter, but the ‘all change’ order was given far less often. See folks, never forget, the worm really can turn if provoked! I don’t doubt that happened. I have heard of similar at Colindale in the 1960s or 1970s. However I think I can be pretty sure that in each case by the time they agreed to take the train on the passengers would have been more delayed than if they had let the train go and waited for the next one to their destination. So not only did they not really achieve anything, they also disrupted many other passengers who would have been severely inconvenienced. This is not only those delayed on the trains behind but also those who would have caught the terminated train in the other direction. Also, you say it happened less often so the worm can really turn but how do you know they didn’t just stop running the trains in passenger service (or at all) if they suspected that there would be a problem getting the passengers off? I’ve seen mutinies at Turnham Green where a train full of passengers going to Richmond was signalled for the Ealing line. After a standoff (and no assurances that any other Richmond train was in the offing) the driver persuaded the signaller that it was a bit late to change the destination as no-one on the train actually wanted to go to Ealing! (having let it go further back down the line). I have heard of similar mutinies at East Finchley. Queen’s Park turn-arounds on the Bakerloo sit in the sidings for such a short-time anyway that it wouldn’t seem to be a problem, better than delaying the service. Those that turn at Harrow & Wealdstone are definitely checked before entering the siding, but there’s more time there! Oh boy, have I got an info dump for you! British Museum siding on the Central has been disconnected and the P&C plain-lined. I’m sure the Maintainer was overjoyed at being given so much space to store spares in – the crossover caverns are capacious! Queensway is no longer shown as having a siding on the network diagram, just a cross-over. Archway siding has one of the tightest curve switches on the network, which means it cannot be accessed any faster than 5mph off the NB. This limits its utility because as you pointed out, a lot of a siding’s use comes from being able to quickly get a train into it. I’ve seen plans for an extra siding next to the existing Colindale one, and to reinstate the SB exit from Edgware depot into the running lines (currently non-existent but marked on Carto) which bypass Edgware. There are also plans ahead for reconfiguring Highgate Sidings, IF the scope can ever be agreed. Mansion House bay siding has now been removed as S7 doesn’t fit into it and no scope for extension due to its position between the running lines. Three Sidings off Platform 7 @ Ealing Broadway have been removed along with half the crossover. The remaining half is used to access P7 so has been simplified. There was another short bay between the current P7 & P8 which accounts for the staggered shape of P8 compared to P7 which you can see on Google Earth but this was removed many years ago. Acton Town has 3 sidings between the running lines, 1 of which the S7 is allowed in; the other 2 are restricted to 73TS. Engineering vehicles are permitted in all 3. There’s also the shunt-necks to Acton Works adjacent which I’m sure get used as stabling points. Northfields has a reversing siding behind the station (not to be confused with the depot) which is just long enough for an S7 to shunt in if it draws right up to the stoplights. 73TS is shorter so easily able to turn round there. There are also a myriad of sidings in the depot for engineering vehicles, as well as passenger stock. Down Street Siding is indeed long enough for 2 trains of 73TS but is only signalled for 1; there are red lights on the walls midway along. There’s still the original buffer and stop light at the very end so you could still trip past the trainstop if you have a mind to. Heathrow T5 has 2 very new and shiny reversing roads beyond the station. Each can fit 1 73TS plus a bit extra and has lovely safe walkways and platforms for drivers; plus emergency exits at the end of each. T5 is the only station solely served by LU but not managed by LU, it has a BAA staff-member managing it and an LU Station Supervisor under him. I’m also reliably informed that partway around the T4 loop is an vent/escape shaft that brings you out in some grass in the middle of Heathrow airport! Cockfosters has a rotten old siding off Platform 4 which is un-electrified and literally falling to pieces. There’s even a sleeper bolted across the track at the end, presumably as the buffer is un-sound. It appears this siding is nominally used for engineering vehicles only, and I can certainly believe that, as it would not pass muster for passenger stock (even empty). There’s evidence to suggest that there were once +2 more sidings next to it, in a fan of 3, but the area where these stood is now forrested and no tracks remain there. Lastly, Lilliebridge depot underneath Earl’s Court 1+2 could fill a book about sidings! I am wondering though about the Northern Line having more turnback facility on the southern branch during the morning peaks in order to provide much capacity for the severely congested Clapham Common-Kennington section? If you take the Central Line in the peaks, most eastbound do not go all the way to Epping but a number terminate/turnback at Loughton and Leytonstone. Clapham Common had scissors crossover tracks taken out in 1971 when the Victoria Line opened in Brixton (presumably some Northern Line trains terminated at Clapham Common and ‘turned back at the station’?). Were these to be re-instated, you could have some southbound trains terminating at Clapham Common with a driver ready to take the train back into service northbound, so clearing much of the platform – there is no waiting around to empty the train because it is ‘turning round’ there and then. Some would say ‘this is robbing Peter to pay Paul’ – but equally I would contend that in trying to have capacity/frequency along the whole of the southern branch you are depriving key capacity where it is most needed. Evidently the Central Line operates on the principle of building operational resilience and adding capacity along key sections (otherwise everything would run to Epping). Turning a train round in two-platform through station will always impact capacity, even if there is no tipping out. Partly because of departing in the opposite direction, but also because it ties the timetables of the two directions too intimately together (same reason two people tied in a three-legged-race configuration are slower than a lone runner). Even if the timetable aligns an arrival time perfectly to fit in a gap in the other direction, if either direction is delayed, even by a few seconds, the same delay immediately hits the opposite direction as well. Of course it might still sometimes be the right thing to do, if the critical constraint is number of trains, rather than through-the-centre capacity. But anyway the Central line is not a suitable comparison, because the turning points both have three platforms (and what’s more Loughton is outside of a line-split). You comment is almost identical to your comment made a couple of years ago here. So no repetition please. I suspect the “depriving key capacity where it is most needed” is the most contentious bit of what you state because you have done nothing to back this up and I am sure it would be disputed by some starting their journey from further down the Northern line. Provided there are enough trains to do so, and turnback arrangements at the terminus are not the limiting factor on capacity, running everything end to end will provide the maximum frequency. If there are not enough trains to provide the minimum-interval service throughout the line, there might be a case for turning short. But turning back from the platform causes delays to following trains as you need to wait for a slot in the reverse direction. Using a turnback siding like the one at Tooting Broadway also causes delays as you have to ensure the train is empty before driving in to it. A centre bay (such as at White City or the one recently removed at Putney Bridge) can work. But there are none on the southern end of the Northern Line. Probably cheaper to build more trains! Moreover, in the reverse direction, it will make it very difficult for the longer-distance passengers to use the fewer trains going all the way, unless you can find a way of dissuading short-distance passengers from using them. (This is going to be a serious problem for Crossrail, with hordes of short-distance passengers cramming on the first train that comes in, and crowding out someone who has been waiting 25 minutes for it because they are going all the way to Twyford). On my way home 18/11/15 at 18:16 (details from picture I took) there were some service issues and gaps and an S7 waiting in the centre platform at Mansion House, in service awaiting departure to Wimbledon, however not for at least 10 minutes I was advised. I didn’t have time to expand on this further with him as after a >5 minute wait a westbound train arrived and I needed to get home. If I’d had the time I would have travelled on it. I’m guessing the service issues that night had led to an ‘exceptional’ use of the bay for an S7 train. What rule or operational reason was overridden on that occasion so the S7 could be turned at Mansion House? Hi for all this: I am not disputing there are capacity issues south of Clapham Common but that the problems are particularly acute – and as this main article argues that sidings/turnback does happen precisely to inject capacity along certain parts of a route, it is worth discussing whether this concept can be applied or not to the Northern. Why not? ie use Clapham Common rather than Tooting Broadway as the short-terminus. Anyone can make an argument for the status quo but in the light of on-going problems (and TfL urging passengers a few years back to avoid the Tube) surely this is a discussion that can be revisited? Nick Biskinis: My argument is only for the status quo because your proposal would not work – it would diminish capacity not increase it. And I vaguely recall that the same was said the last time you raised it. By all means come back to a topic if you have something fresh to say about it. But a pointless replay is, well, rather pointless. I wonder though what the Crossrail 2 effect would be if it served Balham? (this is why incidentally a lot of Clapham councillors support Crossrail 2 to Balham over Tooting Broadway). Actually I was putting the question out to see if there were new ideas. I did recall a few years ago on the District Dave forum someone stating that when the 1995 Tube stock was new ‘Clapham Common’ was one of the final destination signs because LT were thinking of re-instating the crossovers. I spoke to TfL about this more recently and in fact cited the Central Line example (ie trains turn back at Leytonstone and Loughton): TfL said that the main problem was the island plaftorm whereas with a ‘third’ platform at Loughton/Leytonstone you can turnback whilst keeping a steady flow on to Epping. So maybe that is the reason. That said, there is a case though for Clapham Common replacing Tooting Broadway as the short-work terminus (ie all trains run either to Morden or with a few going to Clapham Common) but…I leave it that. 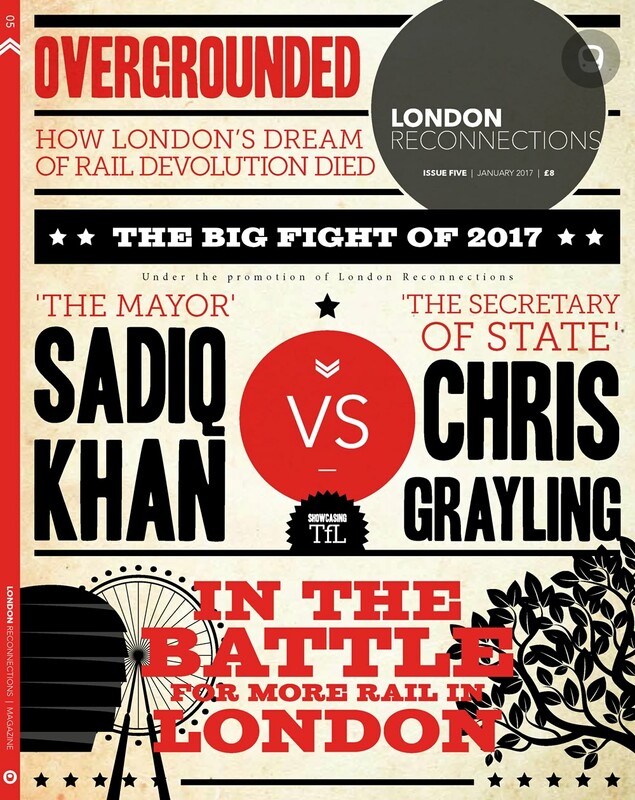 The Crossrail 2 effect is an interesting question. The planners say it will take passengers off the Northern Line, but interchanges work both ways and much of SW London and Surrey may see it as a more convenient way to the City than the Drain. @Nickbiskinis -I really wouldn’t keep scratching this one. If trains terminate in a simple crossover in the midst of a line, the key constraint is the interval between successive trains – in the case of a 40 tph service, for example,90 secs, during somewhat less time than this, you have to terminate the train by emptying it (and checking it’s empty), drive it on to the track in the other direction – but only if there is a suitable gap coming towards you at that precise time in the other direction (if there isn’t, then you can’t move, so delaying whatever’s behind you). You then have to reverse: either you have stepping back (but that requires somewhere for the new crew to wait* while their train turns up), or you have to allow for the driver to walk back through the train and reset the controls – tricky in 90sec. Which is why centre-road extra ( i.e. three-platform) solutions work & NB’s one won’t. OTOH, closing & lifting the centre-road @ “Mansion House” strikes me as a possibly retrograde step, stock-lengths notwithstanding. @ GH – I think, but am happy to be corrected, that some of the points removals on LU have been about reducing maintenance costs and also raising line speeds even if only marginally. Easing out speed restrictions and raising line speeds all add up when trying to raise line capacity and service levels with new signalling. With new trains, improved tracks and new signalling the need for refuge sidings / turnbacks should reduce once all the new assets are working at high reliability levels. @WW – and that’s another good reason for not having crossovers! Also, plain line is inherently safer than having points. There is always a price to pay (apart from a monetary one) for having them. If I may very briefly comment on the Clapham turnback concept – because judging by some of the replies (Graham H) I think there is a misunderstanding of what I was trying say. It is that, with the crossover tracks installed, a southbound peak train could end at Clapham Common and ‘become’ a northbound Bank branch train – so passengers board there and then. The train would then depart in service and use the crossover tracks to enter the northbound route. Hence turnback would be very quick – the idea is not that trains terminate, head into the crossover, then head into the northbound side of the island platform to load up on passengers. As it happens when discussing with TfL rebuilding Clapham Common I have envisaged it as a three track two platform station which would allow a still easier turnback facility. @ Nick B – the problem with your concept is that LU trains don’t have auto start up like DLR trains. Even if a driver was waiting right by the cab it would take some time for the arriving driver to “switch off”, the departing driver to “switch on”, for passengers to alight and then for the points to set and departure to happen. The train would also almost certainly be speed restricted as it crossed tracks to the n/b. All of this is likely to take longer than 2 minutes which is supposed to be the headway on the Morden branch. That means the s/b service would almost certainly have to stop resulting in wider headways and possible blocking back towards Kennington. There is also the point made by others that you would need a scheduled “gap” in the n/b service to allow your turned train to slot in to. All that does is result in wider headways south of Clapham with more congestion and heavier loadings. I understand the problem you’re trying to fix but I don’t think your solution is the answer as it causes more issues than it fixes. This has been fully discussed before. No more please. I think the recent discussion is a good one to add to the library of solutions in search* of a problem and in this case the “wrong” problem has been identified. The current fundamental problem that causes crowding issues on the southern end of the Northern line is pedestrian flow at Bank station which is being addressed with the big rebuild starting this year which will enable the frequency on the Bank – Morden Route to increase by 4tph. With an increase of 4tph turnback at Clapham becomes even more problematic. Increasing the loading on the Morden turnback services will increase dwell times unevenly on services which defeats trying to increase frequencies overall. The next problem after removing the Bank problem is Camden Town and the increase in frequency associated with solving that including split would make turnback virtually impossible. The DLR has installed a series of extra sidings in recent years. These include outside Tower Gateway, Mudchute, a central one south of Canning Town, and Royal Victoria (which must be visible from the Canning Town one). I’ve actually never seen any of these in use. It’s strange that while key strategic ones seem to be getting removed from the Underground, they are being added to the DLR. @ Mr Beckton – I’d hazard a guess that the DLR facilities are part bolt hole and part sidings for sectional working during planned works. Given the DLR’s typically high reliaibility I’d not expect to see sidings and turn backs in use during normal service hours. DLR also seem to try to avoid too many conflicting movements if they possibly can and the relative agility of the trains (light rail capabilities) allows for infrastructure designs which are more feasible than for heavy rail (tighter curves, steeper gradients etc). DLR’s facilities are also all “designed in” as part of the network with many of the early weaknesses having been ironed out. LU has a different challenge of trying to raise capacity and operate more mileage to cope with high demand levels. That explains in part some of the removal of facilities. Rising reliability and better asset management in recent years means there is less need for bolt holes and turn backs. Of course once facilities have been removed you have to keep on top of the reliability and asset management to avoid massive problems in future where a train failure means huge disruption over long sections because there’s nowhere to turn a train. Adding a turnback anywhere on the southern section of the Northern Line is always going to be more expensive than on the DLR because it’s in a tunnel. And whilst it’s being built, there would be no service at all. The DLR Canning Town siding gets regular use during major events (such as World Travel Mart) at Excel. During those events, DLR make wholesale changes to their timetable – including running high frequency shuttle services between Prince Regent (the most easterly of the Excel stations) and Canning Town. These shuttles run through that siding at Canning Town so that the shuttle can quickly arrive/depart on the eastbound platform. The frequency of the Bank-Lewisham route is slightly reduced during these events to make stock available for the Excel shuttle service. The Mudchute siding does get used, but I agree use of that one is fairly rare. The crossover and points into the Mudchute siding can only be traversed at very low speed, so it isn’t as useful as it should be. I can confirm that there is an emergency exit halfway between T4 and T123 on the Heathrow Branch. In 1985 I was once part an exercise to de-train passengers in an emergency via the track. The train went Wrong Direction Move from Heathrow Central (then called) towards T4 where the train stopped and the front half walked forwards and the back half walked back along the tunnel to an emergency exit that did indeed take us up near to a runway. The exit was called Sanctuary Road if I remember correctly. I think the other half of the passengers were walked to another exit or to the unopened T4. There is indeed an emergency exit between T4 and T123. I exited here once in 1985 before T4 opened as part of an exercise in emergency detrainment. It comes up near to a runway and was/is called Sanctuary Road. It is similar to such ones as Netherton Road (Victoria Line) and Old Ford (Central Line). The escape shaft is shown on Open Street Map here. Sanctuary Road may be named after the animal centre, or it may have just been a random name starting with “S”. It is indeed not specially near a runway, except in the sense that everywhere within a mile or so feels and sounds quite close to a runway during operating hours. The straight section of the Piccadilly Line loop passing Wessex Road shaft – further round the loop, see the map linked by Malcolm – was also designed (rather like the DLR passing the Tower of London) to enable a possible future station to connect with a Perry Oaks terminal building. The T5 lines were built instead. The literature states that the S7 was not authorised to berth in the bay road @ Mansion House as it didn’t ‘fit’ due to berth length (signalling overlap, sighting, distance to the arrestor, etc) although it could *physically* fit (but a very tight squeeze as you noted). The bay road was removed in late 2016. Tower Hill (District)’s will remain. When the S7 was introduced to replace the shorter C-stock (6 cars) it necessitated lots of work to extend platforms. I thought at the time it would be far cheaper to either operate selective door opening (although having a whole carriage potentially migrate through the train was probably a bit much) via the walk-through design of the new trains or to procure an ‘S6’ variant that was identical to the S7/8 apart from being -1 car. However a hypothetical S6 marque would not have improved capacity as much as the S7 has and so the decision was taken to spend the money to secure greater benefit. The increased frequency of service was the majority of the capacity uplift but this has been restricted by the legacy signaling on the sub-surface lines – soon to be finally corrected by the 4LM signal upgrade currently underway. Your hypothetical S6 variant would, I assume, have been used on the Circle/H&C and Edgware Road branch of the District, leaving the s7 for the District main line alone (with seating optimised for the longer distances).